Emed > Bones and Joints > Is Milk Linked to Fractures and Mortality? High Milk Consumption – Is it Associated with Mortality and Fractures? For decades we have been told that drinking cows milk will make our bones strong and reduce the risk of bone conditions such as fractures and osteoporosis later in life. Aside from the fact that other foods such as almonds, broccoli, cucumber, silverbeet, mustard cabbage, bok choy, celery, chick peas, dried figs and dried apricots, calcium set tofu, calcium fortified soy milk, breakfast cereals and fruit juices are rich in calcium, cows milk today is both pasteurised and contain antibiotics – hardly a necessary inclusion in our diet! The British Medical Journal has released a study that examined whether high cows milk consumption is associated with mortality and fractures in both women and men. The Swedish study considered previous research data from more than 100,000 people in Sweden over the course of 11 to 20 years. The research found that a high intake of cows milk had undesirable effects due to milk being the main dietary source of D-galactose – a simple sugar that when combined with glucose becomes the milk sugar lactose. Evidence from a number of cited experiments showed that even a low dose of D-galactose induces changes that resemble natural ageing in animals, including shortened life span caused by oxidative stress damage, chronic inflammation, neurodegeneration, decreased immune response and gene transcriptional changes. What is Considered to be High Milk Consumption? High cows milk consumption was considered to be three or more glasses (a glass is around 200mL) of milk a day (with an average of 680 grams a day) and when compared with less than one glass a day (average 60 grams a day), was associated with higher mortality. Based on a concentration of lactose in cows milk of approximately 5%, one glass of milk comprises about 5 grams of D-galactose. To put this is some perspective while the amount of lactose in one glass of milk corresponds to approximately 5 grams of galactose, the amount in 100 grams of fruits or vegetables is measured in milligrams or tens of milligrams. Researchers contended that because of the high content of lactose in cows milk, high consumption of milk may increase oxidative stress, which in turn affects the risk of mortality and fracture. 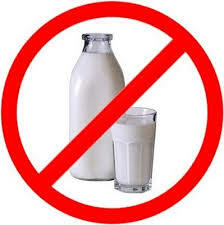 Of importance for the researchers was separating milk intake from the consumption of other dairy products. Oxidative stress and inflammation is much less pronounced in humans with cheese and fermented dairy products (for example soured milk and yoghurt) because of their lower or non-existent lactose and galactose content. The researchers observed a dose dependent higher rate of both mortality and fracture in women and a higher rate of mortality in men with high milk intake. Milk intake was not associated with fracture rate in men. This pattern was not seen with other dairy products. The researchers observed a positive association between high milk intake and markers of oxidative stress (urine 8-iso-PGF2α) and inflammation (serum interleukin 6). Previously researchers had found a negative relationship between bone mineral density and 8-iso-PGF2α. Interleukin 6 seems to be causally related to cardiovascular disease and may influence bone loss and osteoporosis. Individuals who consume high amounts of cows milk have a more unfavourable cardiovascular risk factor profile, with higher blood pressure, lower high density lipoprotein cholesterol levels and higher insulin resistance. Particularly noteworthy is that intake of fermented milk products such as yoghurt, soured milk and cheese were associated with lower rates of fracture and mortality. Every daily serving of fermented dairy was associated with a 10 to 15 percent reduction in risk in fracture and mortality for women but the effect was less noticeable for men. Additionally these products were related to higher high density lipoprotein cholesterol levels, less insulin resistance and a lower risk of myocardial infarction. A recent small randomised cross over study indicated that the intake of a fermented dairy diet seemed to provide a more favourable biomarker profile than that of a non-fermented dairy diet. From this study it appears as though advice to drink lots of cows milk to strengthen your bones is a fallacy. Due to the D-Galactose content too much milk actually promotes both inflammation and oxidative stress leading to an increased risk of fractures and mortality for women and mortality for men. Of interest is that fermented dairy products such as yoghurts, soured milk and cheese actually improved outcomes for men and women as well as improving the good cholesterol, reducing insulin resistance and lowering the risk of myocardial infarction. We are not saying that cows milk is all bad. However in order to reduce inflammatory and oxidative stress markers, the amounts consumed should be done with caution with a daily cows milk intake being limited to no more than 2 small glasses / day. Additionally including fermented milk products in your diet will actually improve a number of health outcomes. If you are concerned about bone health especially with conditions like osteoporosis, call Emed to arrange a consultation with one of our practitioners. As there is no mention of lactose free milk, I presume they were not part of the above studies, but what is Emed’ s take on changing our milk over to lactose free?